BRDC Full Member Stephen Jelley claimed the first podium of his British Touring Car Championship career at Croft yesterday, and then went on to produce two more. 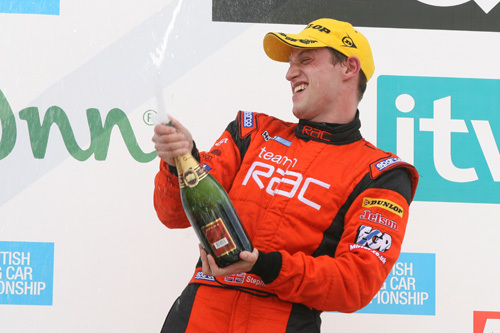 In the first two races Stephen and Team RAC team-mate Colin Turkington, also a BRDC Full Member, tore off in to the distance with Colin taking both victories and Stephen claiming two second places. Jason Plato, a BRDC Full Member, took a comfortable third in both of these. In the final race of the day, Stephen claimed third place, in a race that saw three safety car periods and torrential rain. The winner of the final race was Fabrizio Giovanardi while BRDC Full Member James Thompson was second. Other results from race one saw BRDC Full Member Matt Neal claim sixth place just ahead of the BRDC Superstars Jonny Adam and Andrew Jordan. Paul O’Neill (BRDC Full Member) took ninth while James Thompson was 11th. The race was red flagged before the drivers reached the chequered flag on the final lap as BRDC Full Member Tom Chilton unavoidably smashed into a spinning Harry Vaulkhard, leaving the two cars dangerously on the track. BRDC Full Member Mat Jackson also crashed out while Dan Eaves also failed to finish. In race two, with the podium repeated from race one, Matt Neal was the next highest BRDC finisher in fifth in the VX Racing Vauxhall Vectra just ahead of Superstar Andrew Jordan. James Thompson finished ninth just ahead of Paul O’Neill. With Superstar Jonny Adam failed to finish as he had engine problems on the second lap. The start of the third race saw torrential rain hit the North Yorkshire circuit. Paul O’Neill had been drawn to start from pole alongside James Thompson, but it was Paul who shot in to the lead in the Honda Integra from the start. With Adam Jones crashing out on the second corner the Safety Car was brought out before green flag racing resumed on lap four. But the Safety Car was out again at the end of the lap with two more cars falling foul of the horrendous conditions. On lap ten the field began racing in earnest again, and Paul found he had a battery problem, which led to him losing power and forcing him to pull off the circuit. James Thompson gained the lead as Stephen Jelley moved to third before the Safety Car was out again. When racing began again on lap 14, James was still leading, but not for long as Fabrizio Givanardi passed him, leaving to settle for second ahead of Stephen. Superstar Andrew Jordan was fourth ahead of Jason Plato and Colin Turkington while Matt Neal, Superstar Jonny Adam and Tom Chilton were eighth, ninth and tenth respectively. BRDC Rising Star Tom Onslow-Cole returned to the BTCC paddock with Team Aon, having only received a telephone call early on Saturday morning. Tom struggled with engine problems all day though and did not finish any of the races. Tim Bridgman tore off in to the distance in race one while James moved in to second on lap two, taking the place from BRDC Full Member Michael Caine, who finished third. BRDC Full Member and Superstars Director Tim Harvey finished fourth, just ahead of Rising Star Tom Bradshaw. In race two Michael Caine just held on to second place, despite spinning in torrential rain. Tim Harvey took the final podium spot. He had been battling hard with Michael Caine and did move in to second for a while, but Michael eventually got the better to retain the place. Tim Bridgman, who had lead in to the first corner, was caught out in the rain and went briefly off track, handing the lead to James Sutton. Tim finished fifth. On the support races, BRDC Superstar James Calado took victory in the first Formula Renault UK Championship race of the weekend while BRDC Rising Star Dean Smith was on the top step of the podium in the second race. See the BRDC JUNIOR MEMBERS JUNE 13-14 story for the full report.